The photograph (above) looks across from Chappaquiddick Island to the town of Edgartown, with a view of the Harbor View Hotel at the far right of the buildings. 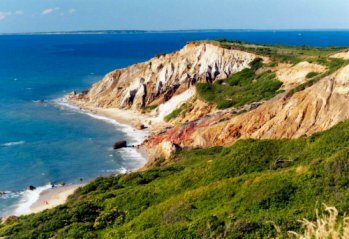 The photograph (to the right) shows the brilliant colors of the mile-long Aquinnah Cliffs, commonly called Gay Head, that contain layers of sands, gravels, and clays. One of the first revolving lighthouses in the country was erected on top of the cliffs in 1799. It had wooden works which became swollen in damp or cold weather, when the lighthouse keeper and his wife would be obliged to stand all night and turn the light by hand. The current red-brick electrified Aquinnah Light stands in its place. The waving bands of color from Aquinnah Cliffs are a national landmark and a popular sunbathing beach for vacationers. Both pictures were taken by William Atkins on June 1997. The MV Gang is a group of friends from Massachusetts, Connecticut, New Jersey, New Hampshire, Washington, D.C., Virginia, Maryland, Illinois, Indiana, Kentucky, Ohio, Pennsylvania, and Texas. Chestnut Street, Oak Bluffs, Martha's Vineyard. 14 Naumkeag Street, Oak Bluffs, Martha's Vineyard. The Dickerman House, 245 Vineyard Meadows Farm Road, West Tisbury, Martha's Vineyard. 25 Hickory Trail, Southern Shores, Outer Banks, North Carolina. The Beachside, Nantucket & The Robinson Vacation Compound, Edgartown, Martha's Vineyard. Castine, Maine and Acadia National Park.